Warriors: Andrew Bogut started for DeMarcus Cousins (sore right ankle) for the second straight game and had two points and six rebounds in 13 minutes. Cousins is expected to play in the next game, Kerr said. … With Curry, Bogut, Green and Thompson in the starting lineup at the same time, the Warriors have won 108 of 133 games. … Jerebko reached double-digit points for the first time in 29 games, since Dec. 22 against Dallas (23 points). Timberwolves: Towns posted his fourth 20-20 game this season. … Rookie Cameron Reynolds was signed for the rest of the season after his second 10-day contract expired. … Taj Gibson hurt his left calf in the second quarter and didn’t return. 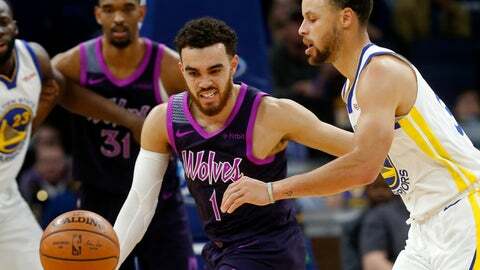 … The Wolves have lost the season series to the Warriors for 10 straight years.